The Sony Walkman giveaway has drawn to a close and it is time to pick the winners. Random.org was once again close at hand to pick the winners. I promoted this giveaway both online and also at the local running group. I was excited to see that when the winners were chosen that there was a winner from the blogger community and another one from the local running group. 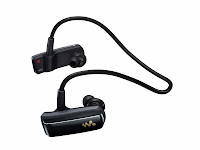 Don't forget that if you are not one of the two winners you still can get your very own Sony Walkman MP3 Player at a discount by going to www.sony.com/runningmate. 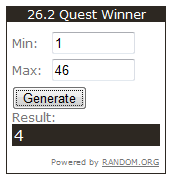 The first winner was selected and the winning number was 4 making Kerrie from Mom Vs Marathon the first winner! If you do not already follow Kerrie you need to follow her blog and stop by and visit her new but very active Facebook Fanpage. The second winner turned out to be a winner from our local running group. I promoted my blog and this giveaway specifically last week at the running group which helped me gain some local readers. The number that was generated was 40 making Karen Heath the second winner. Kerrie, please contact me at info@262quest.com with your shipping information and I will get yours in the mail. Karen, I will get you your MP3 player. Thanks everyone for stopping by, reading, and taking the time to enter! Thank you! Such a crappy day, yet I won two giveaways...not to rub it in or anything. Just a very nice thing. Thanks!